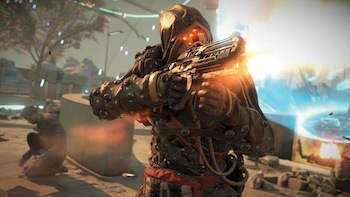 Killzone: Shadow Fall Developers Can Balance Multiplayer "on The Fly"
Killzone: Shadow Fall uses PS4 tech to make balancing patches a thing of the past. Patches can be a nuisance. Sometimes you just want to play a game without having to wait five minutes to download version 1.0124, which tweaks the hit detection of those destructible mannequins in that one map by .01 percent, before jumping in because you've only fifteen minutes to play and no time to spare. Well, it seems the PS4 can dramatically reduce the number of annoying updates dramatically by allowing developers to upload balancing tweaks "on the fly" without a patch. Speaking with OPM, Killzone: Shadow Fall lead designer Eric Boltjes explains that the team will be able to upload balancing patches for the game's multiplayer based on analytics and player feedback in real time. "So if a specific weapon is overpowered," says Boltjes, "you know it's killing too many people and people start complaining, we don't have to release a patch any more. We can, on server side, tweak the damage down on that weapon and instantly everyone will just have a less powerful weapon." That doesn't mean the days of downloading patches are over. Real-time patches can only alter minor backend elements of the game. In order to change anything that will change any perceivable aspect of the game - visual, audio, etc. - will have to be patched in the old fashioned way. "There are going to be patches," says Boltjes. "For example, if we have to change how a weapon looks, that's content. That's content and then it becomes a patch. But if it's variable, numbers that we can change, like weapon balance or stuff like that? That we can do that on the fly. If we want to add new sound? It's a patch. If we want to change how often a weapon fires? That's on the fly."